Aintree's three-day Grand National meeting starts on Thursday and builds to Saturday's big race. More than 500 million people around the world will tune in for the world's most-famous steeplechase, and the Merseyside track will welcome over 150,000 racegoers to the festival. Here's a look at the potential talking points from the showpiece jump racing fixture. Can Rebecca Curtis follow Smith, Williams and Pitman into the history books? There's no doubting the big race potential of Teaforthree, or "Thomas" as he's named for ease's sake at his trainer Rebecca Curtis' stables by the sea in Pembrokeshire, south-west Wales. Finishing third last year, Teaforthree has already demonstrated the stamina to get to the "business end" of the challenge, plus the jumping ability, having taken the 30 obstacles pretty much in his impressive stride. Success would make Curtis, 34 this week, only the fourth woman to train the winner of the world's most-famous horse race, but also the third in six years after Sue Smith (Auroras Encore, 2013) and Venetia Williams (Mon Mome, 2009). With his trainer, his form, his catchy name and the fact that he has an outstanding chance of bridging the 109-year gap since Wales last claimed the prize - with Kirkland (1905) - Teaforthree is the runner onto which many once-a-year punters are hanging their hopes. Smith is also due to saddle contenders: Ryan Mania, rider of Auroras Encore, is on board the stable's Mr Moonshine (who pulled up last year), and Brian Hughes rides Vintage Star. After the defection of its predecessor, and despite fears that adverse publicity surrounding the Grand National might make finding a new backer tricky, Crabbies is taking over the sponsorship mantle with an initial three-year deal. The support of the company, part of the Merseyside-based Halewood International drinks empire, whose founder John Halewood owned 2004 winner Amberleigh House, ensures a £1m total prize fund for the first time. This year's Aintree Festival will be the final one under accomplished chairman Peter Daresbury, who is stepping down after 25 years, which have seen major change,. Modifying the big-race course is the highest profile one, but turning around Aintree's business, which had been in dire straits, has been highly significant too. Daresbury is to be replaced by Rose Patterson, wife of Environment Secretary Owen, and the first woman to hold such a prominent position in the administration of a sport that was practically "men-only" not so many years ago. Will class tell as Tidal Bay and Long Run bring top-notch, Grade 1 form to the party? Proof that the quality of the Grand National field is ever-rising comes in the high profile presence this year of Tidal Bay and Long Run. 13-year-old Tidal Bay, the intended mount of jockey Sam Twiston-Davies, may be getting on a bit, but the expression "ever-green" could have been invented for the popular veteran whose 15 wins include three at racing's highest, Grade 1 level. Long Run, owned by Robert Waley-Cohen, and ridden by his son Sam, has packed much into his nine years, and can boast Grade 1 successes in the Cheltenham Gold Cup (2011) and in two King George VI Chases. To complete the 'Holy Trinity' of top jump races would be an extraordinary feat. Once upon a time, horses like these would, as a rule, have swerved the Grand National, a handicap, not least because of the weights they'd have been allotted. But, Neptune Collonges and three others in the last five years have shouldered 11 stone or more, and like the modified fences on the course these days, fashions are changing as well. That said, if either are to win, Tidal Bay (11st 10lb) and Long Run (11st 9lb) will need to put in the biggest weight-carrying performance since Red Rum humped 12 stone around to his second victory in 1974. Meanwhile, success for Long Run would make Sam Waley-Cohen (Grand National record: a second place, a fourth, a fifth and one fall) the first amateur rider to win since Marcus Armytage on Mr Frisk in 1990. Betting turnover on the Grand National is estimated at something like £350m, so by far the biggest single event of the year. Bookies, keen to boost their coffers further after lucrative results at the Cheltenham Festival, are rubbing their hands at the prospect of an apparently open-ish race, though they admit to having two fears. Success for last year's third Teaforthree would be a disaster for their bank balances, as would any horse ridden to victory by AP McCoy. It took McCoy 15 attempts until finally achieving the Aintree success he'd so long craved on Don't Push It (2010), but the hiccups along the way didn't put off his fans. Whatever horse the 18-time champion jockey is on is guaranteed to be heavily supported, and if it wins, the bookmakers will be handing back much of their Cheltenham profit. For millions at the track, or following via radio, TV or the internet, the Grand National is one of the greatest thrills in the sporting year. Its opponents loathe it with a passion. While the British Horseracing Authority (BHA) and officials at Aintree acknowledge the "inherent risk" to participants, detractors insist it's simply too high for the horses. Two died in each of the Grand Nationals of 2011 and 2012. In recent years, a £1.5m package of changes to the course has been implemented aimed at improving safety measures. The core of the fences is now "more forgiving" plastic rather than wooden, and some of their landing sides have been altered. The Grand National start has moved slightly further away from the noise of the crowds. Two horses lost their lives in other races over the big fences last year, but none in the Grand National during which a much-less-than-usual total of two out of the 40 fell. In all, seventeen finished, while 14 were pulled up, 6 unseated their riders and one refused. The BHA and Aintree will be hoping this is evidence that their endeavours are working. Jump racing's reigning champion trainer Nicky Henderson has been attempting to taste Grand National glory since before most of this year's jockeys were even born. But despite a couple of second places, and a few other near-misses, big-race luck has generally been in short supply for Henderson, who had one ride in the race himself, and was last of 16 finishers behind Rag Trade (1976). This year, hoping for better fortune, he sends a powerful quartet in Long Run, the Cheltenham Gold Cup 10th Triolo D'Alene, Hunt Ball and the attractively-weighted Shakalakaboomboom. Henderson currently trails Paul Nicholls in the race to retain his prize money-judged champion's crown, so a victory in the Grand National (£560,000-plus to the winner) could be key. Also looking to fill frustrating gaps in their CVs when it comes to Aintree are trainer Philip Hobbs and his number one rider Richard Johnson. The pair, whose What's Up Boys led over the last only to be caught late on by Bindaree (2002), team up with Balthazar King, last year's 15th, and a two-time Cheltenham Festival winner. Success for Johnson - "Dicky" throughout racing - would be especially popular as the 36-year-old is the uncomplaining, perennial runner-up in the jump jockeys' title race to AP McCoy. Without him, Johnson would be a many-time champion himself. Balthazar King is his 18th Grand National mount. The Grand National Festival at Aintree lasts three days in all, and as the years have gone by, the races that provide a supporting role to the principal feature have grown and grown in stature. 2012 Champion Hurdler Rock On Ruby, a big disappointment in the Arkle Chase at the Cheltenham Festival, abandons fences to line-up in day one's Doom Bar Aintree Hurdle. Trainer Harry Fry has said the horse, who'll take on a field including this season's luckless Champion Hurdle third The New One, "doesn't quite have the scope for chasing at the highest level" so goes back to "what he does best". His steeplechasing days are probably over. The New One, trained by Nigel Twiston-Davies and the mount of his jockey son Sam, looks for quick retribution after being severely impeded at Cheltenham, but then powering home. Also, on a glittering card to open the fixture, Dynaste, winner of the Ryanair Chase, Cheltenham is expected to line up alongside Gold Cup fourth Silviniaco Conti and the talented First Lieutenant (missed Cheltenham) in an intriguing running of the Betfred Bowl. Owners Graham and Andrea Wylie, out of luck with the narrowly beaten Cheltenham Gold Cup second On His Own, have Tidal Bay and Prince De Beauchene, both with decent chances of going one place better. Veteran jockey Brian Harding attempts to extend an already enviable record around the big fences on the Jonjo O'Neill-trained Burton Port. In eight attempts, the 41-year-old has completed the course six times including a third place on Simply Gifted (2005). The Rainbow Hunter seeks to turn back the years for trainer Kim Bailey, responsible for 1990 winner Mr Frisk. Aidan Coleman is due to ride The Rainbow Hunter, a recent Doncaster winner, but a victim of the hurly burly at the Canal Turn (first circuit) last year. Across The Bay's jockey Henry Brooke has already played a part in the 2014 Grand National, impressing producers with his artily moody performance in a TV trailer. However, the even bigger role of looking ecstatic in the Aintree winners' enclosure, would fulfil a long-held ambition for the 23-year-old. Across The Bay, trained for a syndicate of Merseyside owners by Donald McCain, son of Ginger, finished a creditable 14th in 2013. The 12-horse string of Worcestershire trainer Dr Richard Newland, a former GP, has enjoyed success at the Cheltenham Festival, but has never even had an entry in the Grand National. 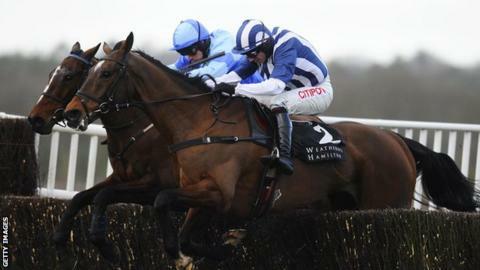 Pineau De Re had his prep race over hurdles, when 3rd, beaten by a couple of whiskers, at the Cheltenham Festival. Recent GN winners Bobbyjo, Papillon, Monty's Pass and Don't Push It all came to Aintree off the back of runs over hurdles.